Are you still afraid to go out because of the air pollution outside? Now, our portable anti-dust mask may solve your worrysome well. This dustproof mask is made of quality TPR material, which is durable, waterproof, breathable and comfortable to use. Suitable for outdoor activities, especially for cycling in winter, which can keep you warm and healthy. 1. 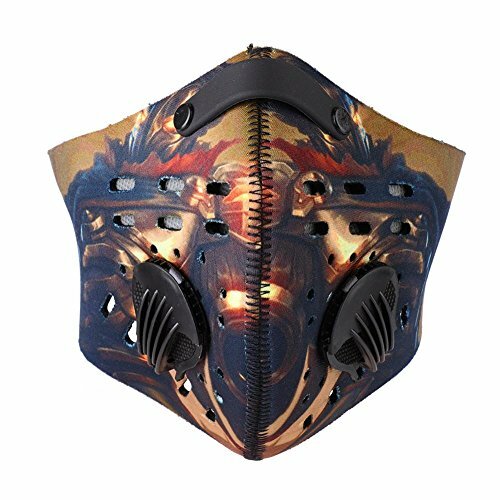 HIGH QUALITY MATERIAL: The dustproof mask is made of sports fabrics, lightweight, soft texture, quick drying, breathable and comfortable to wear. 2. HIGH-END DESIGN: The perfect combination of ergonomics, size can be adjusted to meet the most head type.According to the person face design, keep out the bridge of the nose the following part, have the nose clip fixed, to prevent the slide. 3. FILTER MASK: Ultra-fine filter, one-way filter valves and good breath ability make it a professional filter mask that can filter out PM2.5, suspended particles, haze, dust, exhaust gas, and other particle with minimum diameter of 3 microns. 4. WIDE APPLICATION: Suitable for cycling, running, hiking, skiing and other outdoor activities; also worked for indoor usage like carpenter. Can be also used as haze day protection, anti-dust and so on. Note: Please allow some errors of manual measurement, thank you for your understanding. HIGH QUALITY MATERIAL: The dustproof mask is made of sports fabrics, lightweight, soft texture, quick drying, breathable and comfortable to wear. HIGH-END DESIGN: The perfect combination of ergonomics, size can be adjusted to meet the most head type.According to the person face design, keep out the bridge of the nose the following part, have the nose clip fixed, to prevent the slide. FILTER MASK: Ultra-fine filter, one-way filter valves and good breath ability make it a professional filter mask that can filter out PM2.5, suspended particles, haze, dust, exhaust gas, and other particle with minimum diameter of 3 microns. WIDE APPLICATION: Suitable for cycling, running, hiking, skiing and other outdoor activities; also worked for indoor usage like carpenter. Can be also used as haze day protection, anti-dust and so on.